It’s that time of year when a tickle in the back of the throat can set off a panic, threatening to mess with your plans and take you out for who knows how long. We’ve got you. 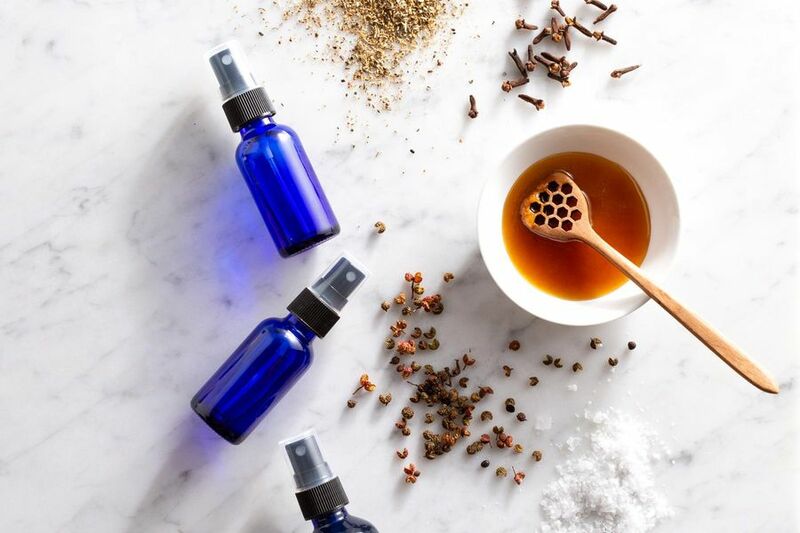 This simple DIY throat spray is made with all-natural, good-for-you ingredients that can soothe the pain and help you feel better, and it takes only a few minutes to make. We like it with mint tea, but you can use black tea or try a medicinal tea like Throat Coat or Gypsy Cold Care. 1. In a medium sauce pot bring 1 cup water to a boil; turn off the heat add the tea bags and the peppercorns let steep, 5 to 10 minutes. Let cool to room temperature. 2. Stir in the apple cider vinegar, honey, salt, peppermint oil, lemon oil, and clove oil. Pour the mixture through a strainer into a spouted measuring cup or bowl to remove the peppercorns. Place a funnel over a spray bottle and pour the mixture into the spray bottle. Spray towards the back of the mouth as often as needed. Store in the refrigerator for up to 1 month.